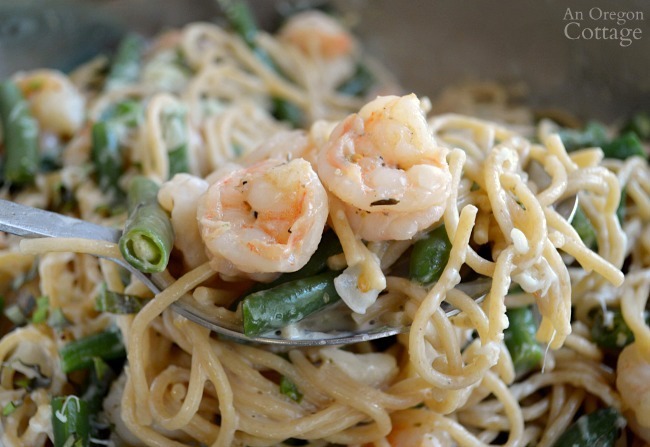 Use fresh garden or farmer’s market produce to whip up creamy garlic shrimp and green bean pasta – an easy 30 minute meal perfect for weeknights. 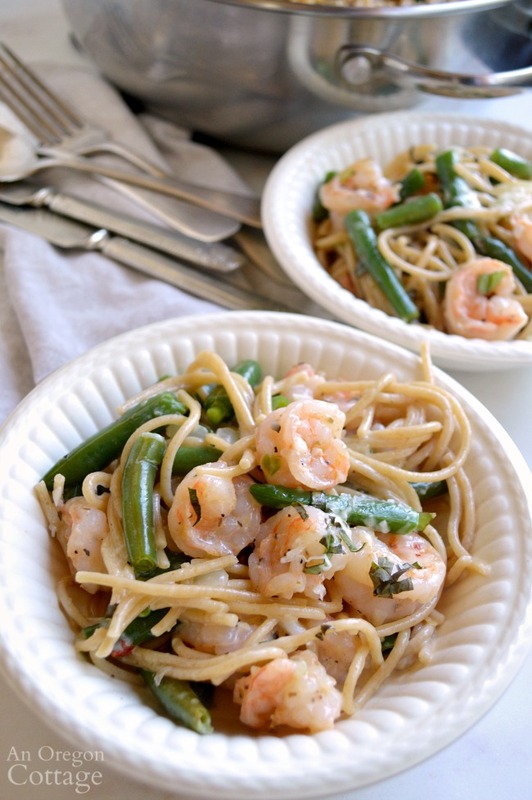 Two pots – one for the pasta and beans, one for the shrimp and sauce – plus fresh and healthy ingredients equal a one-dish dinner everyone will love. 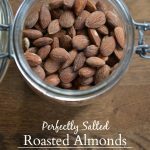 Check out more Quick Healthy Recipes like this one! 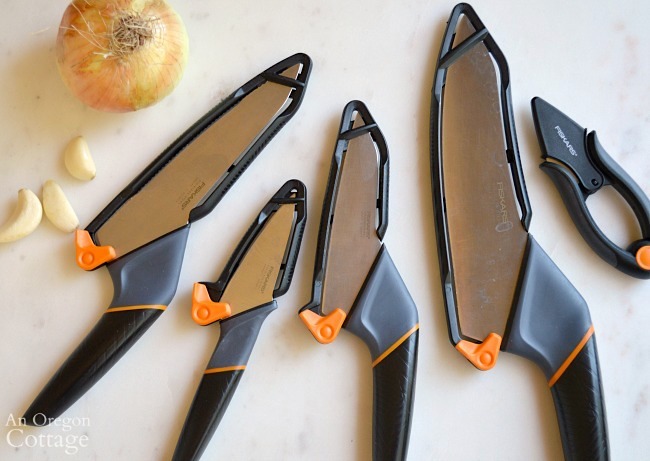 This article is sponsored by Fiskars, whose new line of knives I’m loving using in my kitchen. Thank you for supporting the companies that make An Oregon Cottage possible! 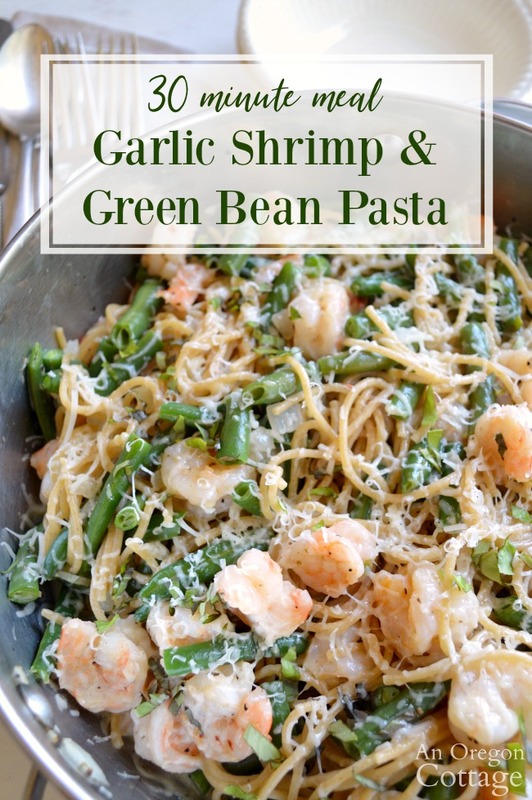 I’m pretty excited to be sharing this recipe for garlic shrimp and green bean pasta with you – it’s been a family favorite ever since I made it up on a whim a few years ago when I had a bunch of green beans harvested and shrimp in the freezer. It was a regular weeknight (meaning, no time for fancy stuff – just get some food on the table) and I used ingredients that cook fast and that I thought would go well together. And did they ever. 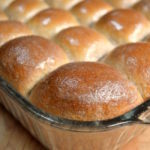 My daughter immediately said I had to make it again and Brian simply ate a second helping – always a good sign. It’s a really tasty recipe with flavors of parmesan, Italian seasonings, white wine (or chicken broth), and cream that coat the shrimp and vegetables. Shrimp and pasta recipes are pretty classic, but I think we were all surprised at how good the ingredients I used came together! This shrimp dinner also super easy to put together – honestly, peeling the shrimp is the thing that takes the most time. 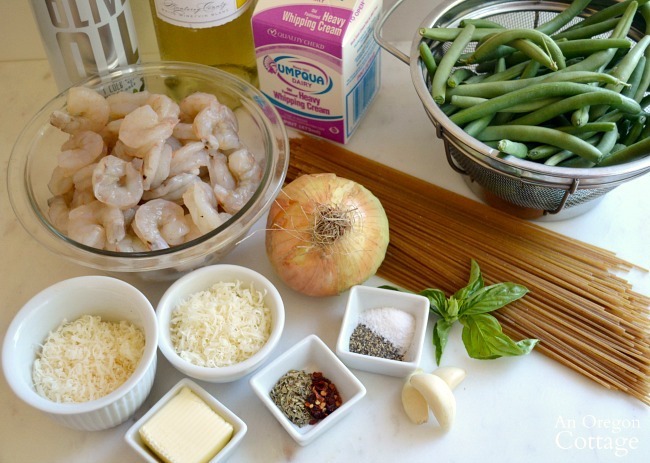 If your shrimp is ready to go, this dish will take just 15 to 20 minutes because the beans cook with the pasta and the garlic-onion-shrimp mixture is sautéed while the pasta cooks. An efficient kitchen is a good thing, right? 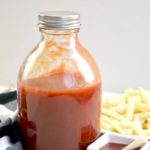 I’m including directions for making this with already peeled and cooked shrimp if you’d like to use it – it works fine, I just find the shrimp is a little less tender than using raw shrimp that you cook with the garlic-onion mixture. Most of these items are pantry staples so if I have green beans and shrimp I can pull this dinner together anytime. Knives are an essential part of any kitchen and most recipes. 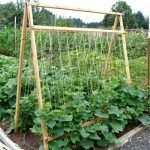 If you’re a regular AOC reader you know that I’ve partnered with Fiskars a number of times to bring you ideas, tips and DIYs that use their quality garden tools (How to Make a Long-Lasting Raised Bed, How to Prune Shrubs with Confidence, and Spring Garden Clean Up to name a few). When they shared with me that they’ve released a new line of kitchen knives, I couldn’t wait to try them – we all know they’ve got the cutting thing down with from their classic orange-handled scissors! 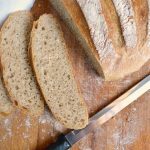 I’ve been using the new Summit Knives now for a few months, testing them on everything from vegetables to meat to bread. And they work like a charm, unsurprisingly since I expected sharp blades from Fiskars! But what is surprising – at least to me – is the unique shape of the handles and what a difference that it makes, especially when chopping large amounts of produce. 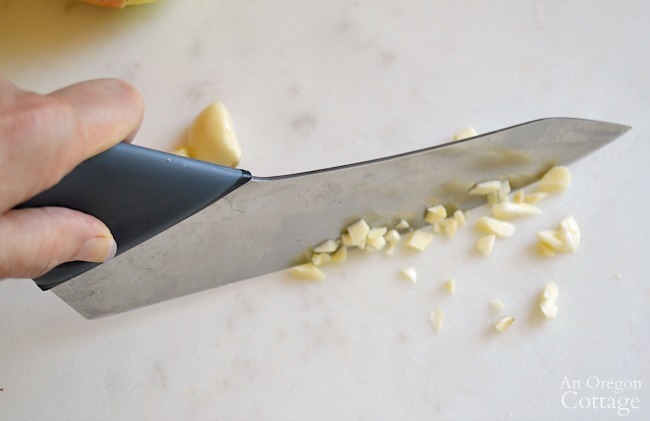 Each knife has a “pinch-grip zone” close to the blade where you are able to hold the knife for the best control when cutting and chopping. The blades are ultra-sharp, Japanese-grade, stainless steel for long-lasting sharpness. And they come with the plastic blade guards you see in the photo above that protect the blades when stored (and your hands when grabbing a knife!). See how the pinch-grip area creates the perfect spot for your thumb and fingers to rest around the handle? It not only gives more control, I found it causes less hand fatigue than regular handles. I always hold the knife at the top of the handle when chopping anyway, so I’m finding the pinch-grip to be a perfect design. 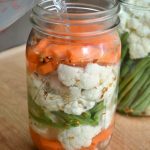 While we’re on the subject of knives and cutting, I wanted to share my easy technique for cutting the whole onion you’ll need for this recipe. 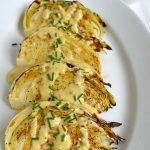 I always found the traditional way of dicing an onion (keeping it whole and cutting two ways through the top of the onion before setting on it’s side to slice off the pieces) to be awkward – and a little dangerous since the whole onion can slip around. Cut the root and tops off the whole onion. 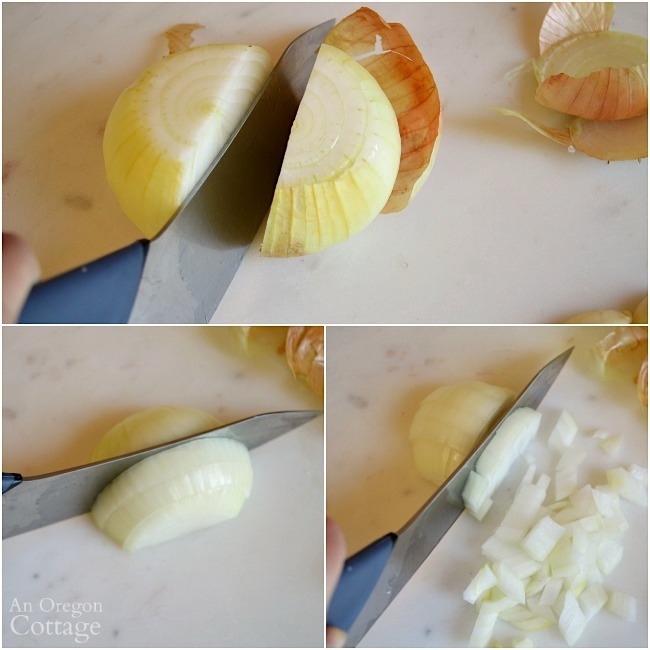 Slice the onion in half and peel (top photo above). Lay one of the halves cut side down on the cutting board and make 1/4-inch slices, lengthwise (lower photo, left). Turn the onion half and cut 1/4-inch slices from top to bottom of onion, holding the lengthwise slices together (lower photo, right). You have diced onion! Some of the pieces may be stuck together since they are the natural layers, but you can either use your fingers to break them apart or just start stirring them into whatever dish you are making – they will come apart more as they are stirred. Repeat with the other half if you are using a whole onion for your recipe (like this one), otherwise store the remaining half in the fridge. Do you cut your onions like this? I feel like I discovered it since no one showed me, but I’ve seen online other people do it, so I know I’m not the only one, lol. 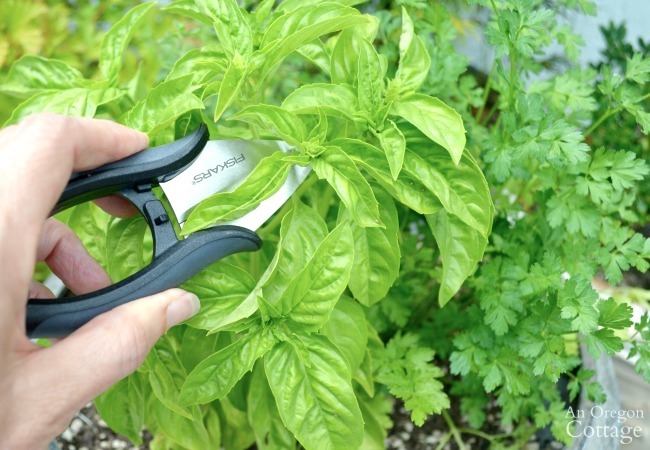 I was also able to try these cute Fast Prep Herb Shears from Fiskars, too, which made harvesting the basil for this recipe super easy. 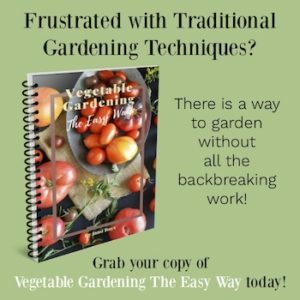 You can go straight from the plant to the dish with these snips – cutting the fresh herb directly over the dish if you wish without the need for a separate knife and cutting board. Pretty cool, plus it’s totally dishwasher safe, so I just threw it in the utensil container to wash when I was done. If you have a deep, wide skillet with two short handles like I do, it makes it so simple to go from cooking right to the table (this pan is sometimes called an everyday pan or a chef’s stir fry pan and I use it a TON – best pan I’ve ever bought!). You cook the shrimp mixture in it and then add the pasta and beans after they’re cooked in a separate pot before mixing it all with the cream and parmesan. 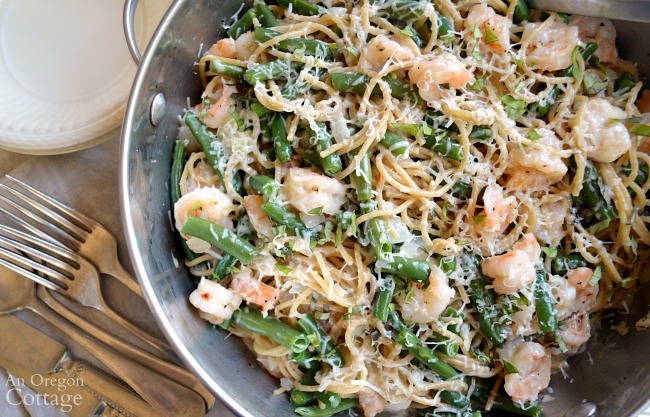 Top with more cheese and snipped basil and serve in the pot – easy. Of course you can also use a regular skillet and pour the shrimp mixture into the larger boiling pot after draining the pasta, mixing it all in there with the cream before pouring out into a large bowl for garnishing and serving. Definitely use what you have! 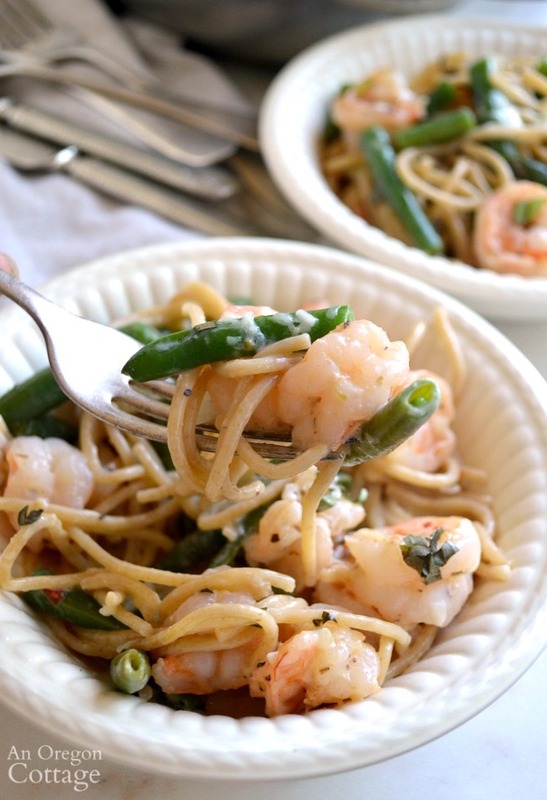 I hope your family loves this creamy, garlic shrimp and green bean pasta as much as our family and that it becomes an easy part of your regular menu planning. 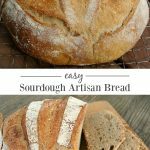 Nothing makes me happier than to hear that you have tried a recipe and liked it enough to add it to your menu rotation, so let me know!